What has happened to the American spirit? We've gone from "Give me liberty, or give me death!" to "Take care of me, please." Our colleges were once bastions of free speech; now they're bastions of speech codes. Our culture once rewarded independence; now it rewards victimhood. 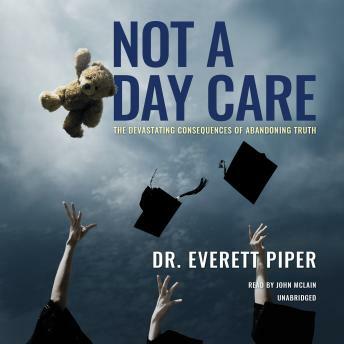 Parents once taught their kids how to fend for themselves; now, any parent who tries may get a visit from the police.In Not a Day Care, Dr. Everett Piper, president of Oklahoma Wesleyan University and author of the viral essay, "This Is Not a Day Care. It's a University!," takes a hard look at what's happening around the country-including the demand for "safe spaces" and trigger warnings at universities like Yale, Brandeis, and Oberlin-and digs in his heels against the sad and dangerous infantilization of the American spirit.